Veronica Moser Sullivan, 6, was killed by a gunman at the Century theater 16 in Aurora, Colo., shortly after midnight on Friday. When Ashley Moser took her 6-year-old daughter to see the midnight showing of the latest Batman movie on Thursday, it was supposed to be a time to unwind after months of hardship. Until recently, Moser and her only child, Veronica Moser-Sullivan, lived with Moser's father -- Veronica's grandfather -- David Moser. They were a tight-knit family. But eight weeks ago, David Moser, 65, died after a 10-month battle with leukemia. Moser's father’s death crushed her, said her aunt, Annie Dalton. “She was close with him,” Dalton said. Dalton said her father’s illness also drained family resources; David Moser was penniless when he died, she said. Ashley Moser and her little girl then moved in with an uncle, where they were living when they headed out for the Cinemark movie theater in Aurora, Colo., a suburb of Denver. At 25, Moser had not had an easy life, her aunt said. "Ashley struggled a lot," Dalton said. But Moser was getting her life in order, Dalton said. She had taken classes to enter a nursing program, her goal being to earn a degree as a licensed practical nurse – the kind of nurse who cares for the sick, injured or disabled. Moser had been accepted into a nursing program and was living off student loan money because she wasn’t employed, Dalton said. 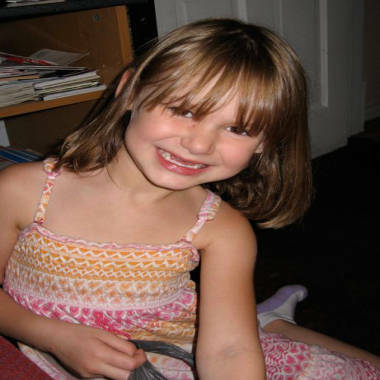 Veronica, Dalton said, was a typical 6-year-old. "She loved school, loved playing," she said. She had just started swimming lessons at a local recreation center, which she enjoyed. She was to start first grade in the fall. But then came the early hours of Friday. Moser, a male friend and Veronica were in the theater, half an hour into The Dark Knight Rises, when a gunman entered and shot 71 people, killing 12. On police radio calls someone is heard saying: "We have a child down and cannot evacuate." The gunman killed Veronica; Moser caught a bullet to the neck. Dalton said she is paralyzed. In the two days following the shooting, Moser drifted in and out of consciousness at the hospital. On Saturday, Moser’s mother, a chaplain and a doctor sat by her side and told her the devastating news: Her daughter had died in the shooting. Dalton said that despite her niece's extensive injuries, Moser's health appears to be improving. She is awake and talking now, Dalton said on Sunday. For the family, this means more trauma, of course, but also mounting medical bills. Dalton said she believes that Moser is on Medicaid, but money will be tight with additional bills and Veronica’s funeral. Will Colorado shootings suspect James Eagan Holmes ever face trial?